We are pleased to make known to you that the 2019 Bristol Short Story Prize , in association with Tangent Books, is open for entries. The competition is open to all writers around the world whether published or unpublished, UK or non-UK based. 20 stories will be shortlisted and published in Bristol Short Story Prize Anthology Volume 12. The winner and 2 runners up will be selected from the shortlist and announced at an awards ceremony which will be held in Bristol in October 2019. Bristol Short Story Prize Eligibility. Stories may be on any theme or subject. The 2019 Bristol Short Story Prize is open to all published and unpublished writers. 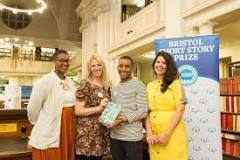 There is no geographical restriction on entry- the 2019 Bristol Short Story Prize is open to everyone, whether they are based in the UK or outside the UK. Bristol Short Story Prize Benefits. All shortlisted writers will receive 2 free copies of the anthology. Prizes will be sent to any writer on the shortlist who is unable to attend the awards ceremony. The winning story will also be published in Bristol 24/7 magazine. This year they are introducing The Sansom Award in recognition of the contribution to Bristol publishing of John and Angela Sansom at Redcliffe Press. A prize of £100 will be awarded to the highest placed story by a Bristol writer. How to Enter Bristol Short Story Prize. Entries can be made online or by post. All entries must be in English. Online entries should be submitted via the online entry facility, usually in Word document, pdf or equivalent. Postal entries will only be accepted as printed typescripts. There are no specific formatting requirements – font type, font size, line spacing etc. Writers may format their work in the way they feel is most appropriate – we do not specify any particular format for submissions. Please send postal entry/entries to: Bristol Short Story Prize, Unit 5.16, Paintworks, Bath Road Bristol BS4 3EH.